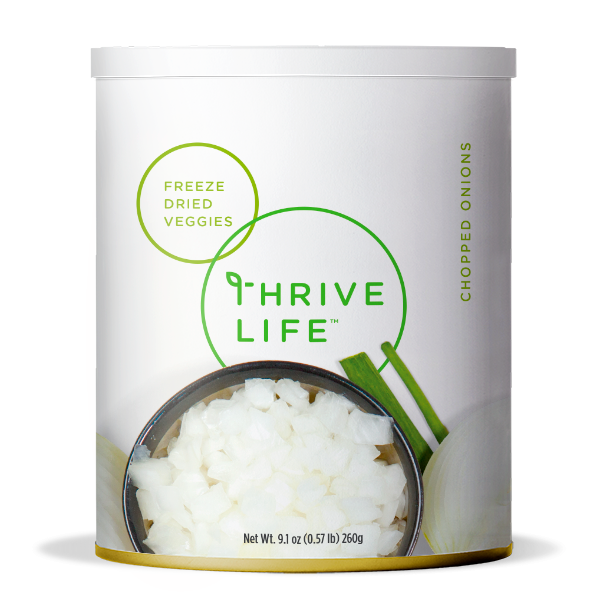 Thrive freeze-dried Chopped Onions come diced and ready to use in your favorite dishes. Thrive Chopped Onions will give a boost of delicious flavor to any of your home-cooked meals. Include Thrive Chopped Onions in your everyday home cooking, and you will create savory meals that have the added benefits of a vitamin C and dietary fiber. Thrive Chopped Onions are perfect for flavoring warm soups, baked casseroles, spicy salsas, and many more of your favorite dishes. Add 1/3 cup of water to 1 cup Chopped Onions; let sit covered for 5-10 minutes or until tender. These thin slices are ideal for pizza toppings, adding flavor to sauces, or sauteing and topping steaks and burgers. When adding to a sauce or veggie mixture, cook them dry in a little butter before adding other ingredients to bring out the flavor better.